I have a quick workshop activity which gives adults a small taste of what it’s like for children beginning to learn to use a new alphabet. I’ve decided to make it available to my gentle blog-readers to try out with colleagues, at workshops etc., to help make the point that learning new, abstract symbols is very difficult. 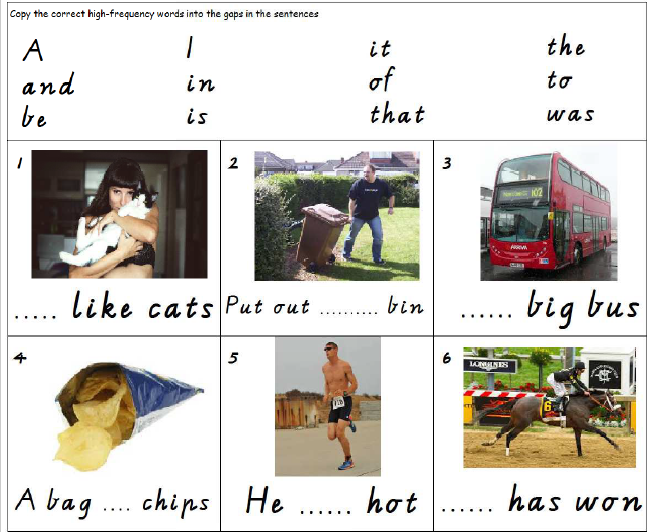 You can download the worksheets for this activity here. The pictures are free-to-use ones from the internet, thanks so much to the generous photographers. Filling gaps in sentences by listening to them being read aloud and copying the relevant high-frequency words. 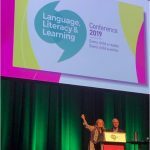 Five-year-olds are often asked to memorise the 12 “golden” words used (a, an, be, I, in, is, it, of, that, the, to, was) as one of their first literacy tasks when starting school. Typically adults find they can do this task quickly and without having to think very hard. 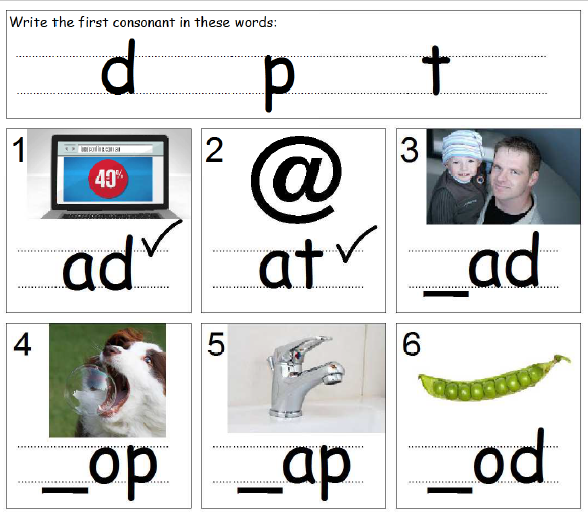 Completing 10 words by listening to each word, identifying the first sound and writing the missing first letter from a choice of three letters – “d”, “p” or “t”. 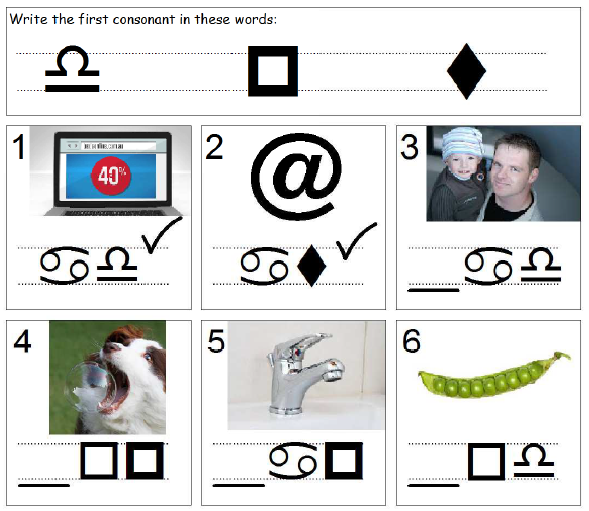 This very simple phonics task is also quick and absolutely easy for adults. The same as Task 1, but in Wingdings. Suddenly what was a simple task becomes close to impossible for adults. The unfamiliar symbols just make the page look like gobbledygook, and they find it very hard to work out which word is which. I hope this experience drives home the message that working with whole words is very hard if you aren’t familiar with at least the basic code used to write them. The same as Task 2, but in Wingdings. 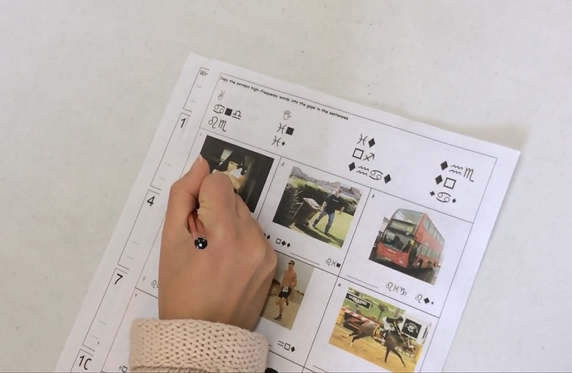 Adults can usually do this task fairly easily, though they have to put a little conscious thought into which letter represents which sound, and how to form it – it’s not fast and automatic like when using familiar symbols, and if the pictures were removed they would still struggle to read the words. 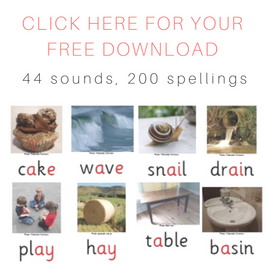 Activities like this teach useful information about sounds and their spellings, which after additional practice can then be applied to other words. 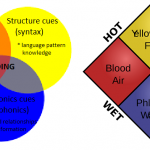 The task does not assume prior knowledge beyond an awareness that words are made of sounds and letters are how we write them, and the ability to segment initial sounds. 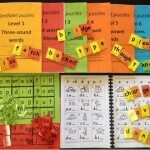 I hope this activity helps to encourage teachers and others working with literacy beginners and strugglers to postpone work on high-frequency words until children have learnt the basics of how to sound out simple words. 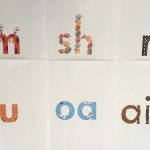 As Professor Anne Castles has pointed out in her recent Read Oxford blog post, sight word teaching should only be “targeted at children who can recognise letters and who have some grasp of the alphabetic principle. 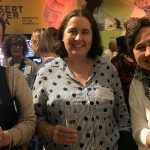 Teaching sight words to children who have not reached this stage – by encouraging them to identify words by their overall shape or by salient visual features – does not transfer to long-term benefits”. 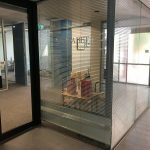 This entry was posted in curricula, hard words, phonics activities, sound-letter links, teaching strategies, whole language on September 15, 2016 by alison. Yet another brilliant – and very generous – post, Alison, thank you so much. I’ve highlighted it here via your thread on the International Foundation for Effective Reading Instruction – and will retweet your post of course!